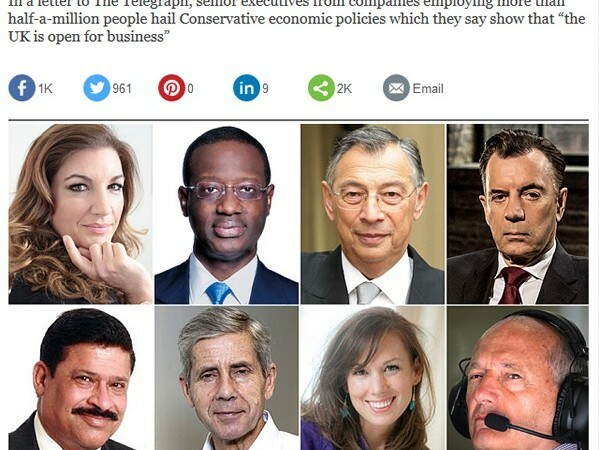 How much weight the public attach to the letter by big business leaders supporting Conservative economic policy depends on whether people think the business leaders in question are motivated by altruism or self-interest. A quick glance at the incredible wealth of some of the signatories, and the pay policies of their companies, makes it very difficult to believe they are concerned about the lives of ordinary people. Despite falling oil prices, BP could still afford to pay Bob Dudley around £9.4 million last year, up from about £8.8 million in 2013, though Aidan Heavey of Tullow Oil wasn’t so lucky – his company’s plummeting share price reduced his pay to just £2.4 million, compared to £2.8 million the previous year. In his final full year at Diageo, Paul Walsh was paid £15.6 million. Mr Walsh has previously argued that higher taxes on the rich make it harder for the UK to attract and retain top talent. Cynics might wonder if there was anyone in particular he had in mind. These pay packages do not necessarily invalidate the opinions of the CEOs (though we should be wary of crediting them with the wisdom of Solomon) or have any bearing on whether they are right or wrong about Labour and Tory economic policies. But such vulgar sums of money do make it easier for critics to argue that the letter’s authors are a bunch of self-serving racketeers concerned only with preserving an economic system that facilitates their own enrichment, rather than public-spirited entrepreneurs who genuinely want what’s best for the country. Many sensible businesspeople have argued that the culture of executive greed – and the public contempt that it engenders – threatens the long-term sustainability of a capitalist system. The damage that such colossal pay packages do to the credibility of the authors of this letter is a very good case in point. Where’s your evidence for that? In fact, the right are responsible for much of the corporate welfare going on, and which has been ramped up under the Coalition. Workfare involving private companies, for instance, is pure corporate welfare. And yes, there’s very much a question how much it should be increased. Remember, OCED have us down near the bottom of the table for tax, and unlike America we have no AMT to ensure a base tax rate for the wealthy. Hence, many richer people here pay little to no tax at all. Why should people pay a rate of tax which at least vaguely resembles their share of the countries wealth? Hmm! And have more ability to pay without compromising their ability to afford food and shelter? We are, as I’ve said, a low tax country per the OECD and have no decent safeguards to ensure that richer people pay essentially any direct tax – even America has an AMT. Do you support, say, a basic income to eliminate welfare traps, eliminate a bunch of government departments and simplify the tax system? (see; Tim Worstall, right wing supporter of such). Thanks Robert for confirming that it was business that struck the first blow. There are no greater arguments than over these obscene bonuses! These people are already earning outrageous salaries way above those professionals of equal and even greater talent. (It is not what you know but who your know) The Banking industry continue to pay these bonuses – even when they became almost bankrupt and had to be bailed out. This application is an unfair procedure and bad for the business itself. It prevents new and fresh ideas being introduced because the money is not re invested in the existing staff – therefore the same procedures will be continued year in and year out – safe! But not futuristic! The EU feeds this self interest because it discourages innovation. It approves new business schemes within certain marketing – but new innovative businesses would outflank economies such as Germany – and this would not be allowed to happen while we are in the EU! Marketing needs to improve drastically – these bonus schemes are damaging both to the company itself but also to the economy in general. Companies should compete with one another, David v Goliath – it is the only way to move forward!